Florence Display Cabinet, Dresser truffle. 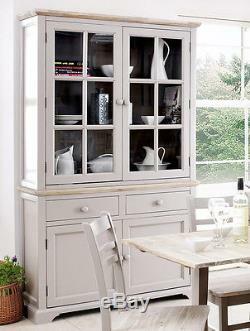 We have designed this dresser / display cabinet to look fantastic in either modern or traditional kitchen. The design is the marriage of the traditional and modern, the welsh cupboard sits on Georgian feet but with a modern acacia brushed plinth and cupboard top. Generously sized cupboard and drawers with a 3 shelf display cabinet. These two furniture pieces can be separated as two stand alone items, due to the display cabinet having its own feet and the bottom welsh cupboard has a full acacia top. Display cabinet has an access point at the top for the light fitting if required. Please note: This item is delivered fully assembled. Our Florence range is available in Dove Grey, White, Truffle and Sage green colour. More colours and products from our Florence range are available from below listings. Dimensions: W:120cm (47.24") H:200cm (78.74") D:42cm (16.54). Material: acacia wood, pine, MDF. Assembly: ASSEMBLED (comes in 2 parts, top and bottom). Features: top glass door cabinet with 2 shelves, 2 door bottom cabinet with 1 shelf. Colour: truffle colour, brushed acacia top. We strive for 5 out of 5 star service. We will do our best to put things right. NOTE: Please supply your telephone number with your order. We cannot dispatch without it. Most of our large and heavy items are delivered by our own vans to ensure the safe arrival of your furniture. In order to keep these charges to an absolute minimum and ensure that your furniture arrives in pristine condition, we deliver by using our van with 2 men to unload and place in a room of your choice. The item "FLORENCE Large Dresser, Trufle Glass Display Cabinet, ASSEMBLED kitchen furniture" is in sale since Monday, May 19, 2014. This item is in the category "Home, Furniture & DIY\Furniture\Cabinets & Cupboards". The seller is "bedroom_furniture_direct" and is located in Herefordshire. This item can be shipped to United Kingdom.